Home / interviews / Interview with Jeong Hyeon-seok of Mara!! Special thanks to Shin Won-jae (신원재) and Hong Ji-yoon (홍지윤) for all their hard work in translating!! 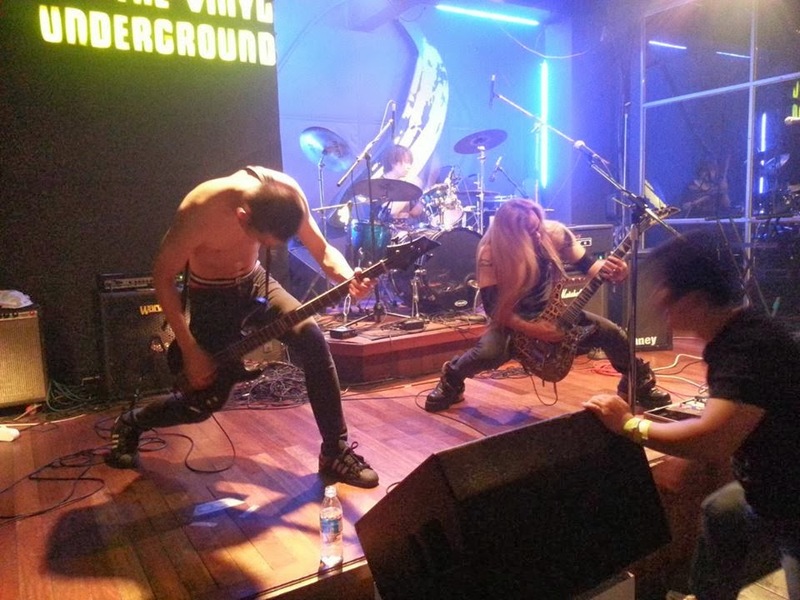 WULF: I have been to a couple shows in Seoul, but I am still new to the Korean metal scene. What is your opinion on the scene here? How does the metal scene in Seoul compare to the scene in your hometown, Busan? Hyeon-seok: In other countries (especially in Western cultures), heavy metal is respected as one popular (or not) genre among various other types of music. However many Koreans still have a prejudice about this kind of intense music. I think it’s still too early for most Koreans to accept heavy metal as a special genre of music. We heavy metal musicians also need to make our music have its own Korean style, and not just copy songs from Western bands. The most noticeable differences between Seoul and Busan are cultural factors. Compared to Busan, for example, Seoul has more stages and spacious facilities that can accommodate many people. Moreover, a number of various festivals are held annually in Seoul, and they attract diverse audiences. WULF: As far as I can tell, it has been almost 10 years since you have released any new music! Is this true? When are you going to put out some new stuff?? Hyeon-seok: In addition to existing songs, we always try to show our own style to audiences every time we’re on stage. Thanks to the compilation album “MM” (Metal Man, split with Niflheim, Notrash, and Exodus of Contemporary, all metal bands from Busan), and our unusual mini-album (“I Don’t Fear to Be Died”), we won some fame as a heavy metal band. With pressure to make our first album perfect, however, we are still hesitating to release it. We will practice harder, and finally release a perfect studio album for our fans. Currently we are trying to make our music better by performing concerts and recording a demo. WULF: Tell us a bit about your band’s history. Who are you? Where does your band name come from? How did your band get started? Why did you decide to play metal? Were you inspired by any older Korean metal bands? Hyeon-seok: A young boy who was a big fan of Kwang-seok Kim and Huyn-sik Kim (Korean folk singers) fell in love with a guitar sound one day. A growling engine, a clap of thunder, and even the sound of rain sounded like the intense tone of the guitar for him. After that, he started devoting himself to playing the guitar everyday. That became a starting point of ‘MARA’. Mara means a demon, the personification of temptation in Buddhist mythology. Although I wasn’t a Buddhist, I was really interested in Buddhism at that time, and also I thought that the word, Mara, could reflect the struggle for overcoming extreme anger and isolation (loneliness) that I was feeling. That’s the reason why I named our band ‘MARA’. Like other players, I practiced the guitar at first by listening to and copying songs of Iron Maiden, Led Zepplin, Judas Priest and so on. Especially, I felt a magnetic attraction to the playing style of Marty Friedman (of Megadeth). I believe heavy metal is the most effective way to express our emotion(sadness and anger). The sound of heavy metal still makes me excited. WULF: How would you describe your music? Hyeon-seok: MARA’s own music. Once we started writing music, we try to avoid listening to other heavy metal songs to find out our own style. Therefore, I can’t compare our songs to anything. WULF: You are scheduled to play at the upcoming Hellride Resurrection of Death Party in early October. What can the audience expect to see during your performance? What are you hoping to accomplish? Hyeon-seok: Since the vocalist of Silent Eye, Seo Jun-hui (and the former president of WASP club) matched us with Death Party, we have participated in every show up to now. It has given us many chances to play on various stages. Also, we are quite pleased to take part in this party again. We hope that it will be a meaningful concert for the audiences, and also we wish not only big fans but people who are not interested in metal music to be fascinated with our music at Death Party. WULF: Could you tell us a bit about your lyrics? What are your songs about? Is your music inspired by any particular books or movies? The scene from the movie, ‘The Crow’, that shows a crow’s stare in the darkness provided an inspiration for our work, and then I could organize MARA’s thought (philosophy) after reading Dante’s ‘Divine Comedy’. WULF: What are your plans for the future? Any new music, tour plans, or maybe even a DVD?? Hyeon-seok: Standing on larger stages, attracting more audiences, making/releasing memorable songs, etc. We are hoping to achieve these goals in the future. Additionally, contributing metal music which will thrive someday is also one of our dreams. We will surely produce a remarkable outcome (new album, DVD, etc) within the next year! To achieve it, we are always doing the best we can. WULF: That’s all the questions for now!! Thank you so much for doing this interview! Any final comments? Hyeon-seok: I could look back on MARA’s 10-year-life during this interview. Especially, while answering your second question, I could realize that it is also important for us to produce visible results while continuing to make music. We really appreciate you giving us a chance to look both back and ahead. WULF: 저는 서울에서 몇 번의 쇼를 봤었는데 여전히 한국의 헤비메탈의 모습은 생소합니다. 한국의 메탈의 모습에 대한 당신의 생각은 어떻습니까? 당신의 고향인 부산과 비교해 봤을 때, 서울의 헤비메탈의 모습은 어떻게 다릅니까? JEONG HYEON-SEOK: 개인적으로 한국메탈의 문제가 아니라 일반대중들이 메탈을 바라볼 때 가지는 선입견이 문제라고 생각한다. 다양한 매체에 의한 자유로운 문화가 자리 잡고 있는 외국에 비해 국내는 많이 좋아지긴 했지만 대중들이 받아들이기에는 아직도 시기가 이른 것 같다. 물론 밴드들도 외국밴드를 카피하는 듯한 메탈에서 벗어나 좀 더 한국적인 메탈로 대중들에게 다가갈 수 있는 다양한 시도를 해야 할 필요가 있다고 생각한다. 서울과 부산의 차이는 역시 위에서 말한 것처럼 문화의 차이라고 생각한다. 부산에 비해 서울은 좀 더 많은 무대, 페스티벌, 다양한문화를 수용할 수 있는 공간적인 여유가 있기 때문에 관객들의 폭이 넓다. 하지만 서울보다 메탈팀이 적은 부산은 밴드들이 힘을 모아 열심히 하고 있는 중이다. 소수의 부산 메탈메니아들 역시 언제나 큰 힘이 된다~! JEONG HYEON-SEOK: 새로운 곡이라기 보단 앨범발매를 말하는 것 같은데 기존의 곡과 새로운 곡, 또 다른 색깔의 마라를 보여주기 위한 다양한 시도를 매번 공연 때마다 하고 있다. 부산메탈연합 “MM”컴필레이션앨범과 국내에선 생소했던 미니싱글앨범으로 마라가 알려지긴 했지만 정규 1집이라는 무게감에 망설이고 있다. 조금 더 신중하게 준비해서 완벽한 정규1집을 보여주고 싶다. 현재는 공연활동과 데모녹음으로 내실을 다지고 있다. WULF: 당신의 밴드의 역사에 대해 좀 말해주세요. 당신은 누군가요? 당신의 밴드의 이름은 어디에서 따 온 이름인가요? 당신의 밴드는 어떻게 시작하게 되었습니까? 당신은 왜 헤비메탈을 하기로 했죠? 혹시 한국의 예전 헤비메탈 밴드에서 영감을 받았나요? JEONG HYEON-SEOK:김광석,김현식(포크송)을 좋아하던 한 소년이 어느 날 헤비메탈을 듣고 전자기타소리에 빠져들었다. 버스엔진소리, 천둥소리, 빗소리에서도 전자기타소리가 느껴졌다. 그 이후로 소년은 미친 듯이 기타연습에 열중했고 그때부터 MARA가 시작되었다 MARA는 내안에 자리 잡고 있는 사악한 악마라는 뜻의 불교용어이다. 종교가 불교는 아니지만 불교사상에 관심이 많았고 내 자신이 품고 있는 극한의 분노와 고독, 그리고 그것을 극복하기위한 자신과의 싸움이 잘 표현된 용어라고 생각했기 때문에 “마라”라는 이름을 짓게 되었다. 여느 헤비메탈 연주자들처럼 나 역시 처음엔 Iron maiden, Led zepplin, Judas priest등의 음악을 듣고 카피하며 연습했다. 특히 Megadeth의 Martin adam friedman의 연주에 매력을 느꼈다. 나에게 헤비메탈이란 , 사람이 가장 슬프고 분노할 때 표출할 수 있는 극한의 감정표현이다. 메탈사운드는 아직도 날 흥분시킨다! WULF: 당신이라면 당신의 음악을 어떻게 비유하겠습니까? JEONG HYEON-SEOK: 마라만의 음악이다. 곡을 만들기 시작한 순간부터 다른 헤비메탈은 가능한 듣지 않고 나만의 색깔을 찾기 위해 노력했다. 그렇기 때문에 마라의 음악은 다른 것에 비유할 수 없다. WULF: 당신은 10월 초에 Hellride Resurrection of Death Party에서 연주하기로 일정이 짜여 있습니다. 청중이 당신의 공연을 보는 동안 어떻게 할 것이라고 생각하십니까? 당신이 이루고 싶은 것은 무엇입니까? JEONG HYEON-SEOK: 예전 WASP클럽 사장님이자 현재 Silent Eye보컬인 ‘서준희’형과의 인연으로 매번 Death Party에 참여해 왔는데 그 계기로 서울에서도 많은 공연을 하게 되었다. 10월 5일 다시 시작되는 Hellride Resurrection of Death Party에 참여하게 되어서 기쁘게 생각한다. 마라에게도 뜻 깊은 공연인 만큼 관객들에게도 뜻 깊은 공연이 되었으면 좋겠다. 메탈매니아들뿐만아이라 호기심에 찾아준 관객들도 메탈음악의 매력을 느낄 수 있는 계기가 되었으면 좋겠다. WULF: 당신의 가사에 대해 말해줄 수 있나요? 당신의 노래는 무엇에 관한 것입니까? 당신의 노래가 어떤 특정한 책이나 영화에서 영감 받았습니까? 당신의 미래의 계획은 무엇입니까? 어떤 노래나 투어공연, 혹은 DVD라도 소식이 있습니까? JEONG HYEON-SEOK: 가사를 통해 하고 싶은 말은 죽음을 마주하는 자세에 관한 것이다. 모든 가사의 내용을 한소절로 표현하자면“죽음은 두렵지 않다. 다만, 슬퍼질 뿐이다”정도가 될 것이다. 마라의 색깔을 잡는 것은 영화“CROW”에서 어두운영상속에 펼쳐지는 까마귀의 또 다른 시선이 도움이 됐고 마라의 생각을 정리하는 것은 단테의 “신곡”이 도움 되었다. 음악하는 사람이면 당연한 생각이겠지만 좀 더 큰 무대, 많은 관객, 기억에 남을 만한 음반을 제작발표하는것이 미래의 목표이다. 그리고 새로운 멤버들이 좀 더 안정을 찾아서 분명 다시 한 번 찾아올 메탈의 부흥에 기여하고 싶다. 공연은 항상 하는 것이고 내년엔 기필코 만족할만한 결과물(음반, DVD)을 보여줄 것이다~!그것을 위해 현재도 연구하고 공부하며 데모녹음을 계속하고 있다. WULF: 이것이 현재까지의 질문입니다. 이 인터뷰를 해주셔서 매우 감사합니다! 마지막으로 하실 말씀 있으십니까? 메탈이란 장르가 대중적이지 않다는 것은 누구보다 잘 알고 있다. 하지만 메탈음악이 좀 더 부흥하기 위해 모든 메탈인들이 힘을 모을 수 있었으면 좋겠다. 마지막으로 인터뷰할 수 있는 기회를 주어 감사하다.